Salamanders are ony o approximately 550 extant species o amphibians within the order Caudata. Thay are typically characterized bi a superficially lizard-lik appearance, wi slender bodies, short noses, an lang tails. Aw kent fossil salamanders an aw extinct species faw unner the order Caudata, while sometimes the extant species are grouped thegither as the Urodela. 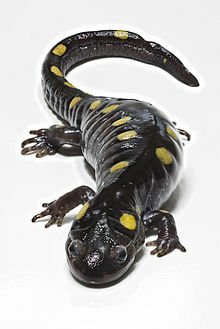 Salamanders hae never mair than fower taes on thair front legs an five on thair rear legs, but some species hae fewer. Thair moist skin uisually maks them reliant on habitats in or near watter, or unner some pertection (e.g., moist grund), eften in a wetland. Some salamander species are fully aquatic throughoot life, some tak tae the watter intermittently, an some are entirely terrestrial as adults. Unique amang vertebrates, thay are capable o regeneratin lost limbs, as well as ither body pairts. Mony o the members o the faimily Salamandridae are kent as esks. The earliest kent salamander fossils hae been foond in geological deposits o Cheenae an Kazakhstan, which hae been datit tae the middle Jurassic period, up tae 164 million (plus or minus 4 million) years ago. This page wis last eeditit on 28 September 2013, at 14:00.